The Web is ‘Search’ and ‘More.’ We already know this intuitively: online content, and our experience of it, is mediated by the range of views and actions made available by the interface and, increasingly, the engine. Web Words is an initial contribution by digital methods to the study of the words employed for what one sees and does on the Web, as well as their larger, online-cultural meanings. 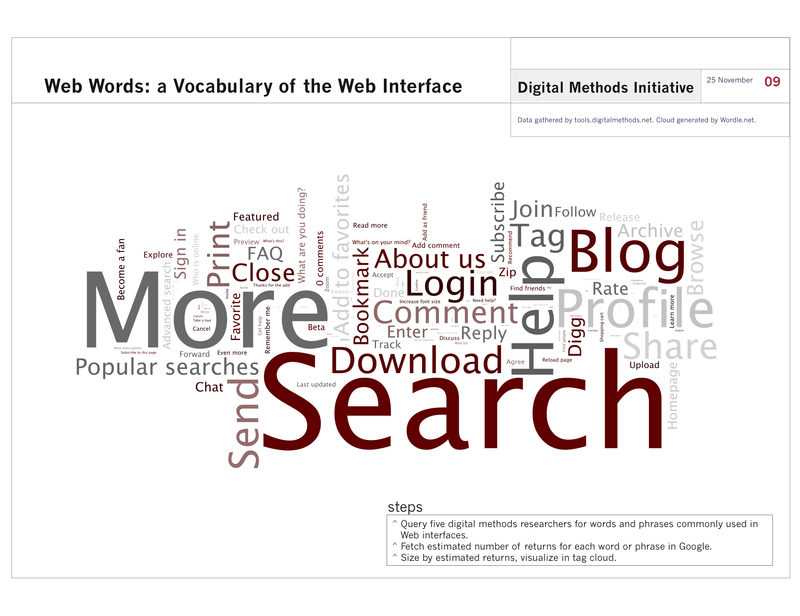 The tag cloud shows the prominence of relevant words and phrases, sized according to the number of results each receives from Google’s search engine. The sample was created during an hour-long session in which five digital methods researchers outputted language they associate with Web interfaces (internet connections were open and spot-checks were allowed, to ensure accuracy). Marginal language (that is to say, words and phrases not or not yet widely used in Web interfaces, including the Oxford English Dictionary’s 2009 word of the year, “unfriend”) may be explored by downloading the pdf. The project recognizes in first instance the historical specificity of Web cultures, including the ongoing substitution of browsing by the current paradigm of search. It also draws on what Web archiving researcher Niels Brügger calls the “textual grammar” of websites in order to make claims about changes in dominant Web interfaces, as well as the cultures these imply. Particular areas of application of Web Words are expected to include the study of the informational Web and the social Web. For example, in the former, the recommendation language demonstrates how the Web organizes culture through attention and relevance, introducing techniques of standing and prominence distinctive to other media (e.g. Last updated, Most Read and Most Emailed.). In the social Web, preference and settings language describes new forms of exposure, privacy and self-presentation cultures (Manage Friends).